Anky van Grunsven’s Salinero has been officially retired from competition. A ceremony for the 19 year old Hanoverian was held at the Brabanthallen in ‘s-Hertogenbosch in The Netherlands on Thursday, during the World Cup dressage show. Anky van Grunsven and Salinero at London 2012. The show started with a video of the stunning career of Salinero and Anky, followed by a performance by Isabell Werth. Anky’s children were also involved and performed a Pas de Deux. 26 Salinero look-a-likes came into the ring, and then it was time for Salinero himself to enter the arena. Anky and Salinero rode their “Dance of Devotion” Kür accompanied with live music by pianist Wibi Soerjadi. Soerjadi composed among others the music for Salinero and Anky’s freestyle “Dance of Devotion” which had its debut on 18 December 2007 in London and with which the pair won the World Cup Final and the gold Olympic medal in 2008. Van Grunsven enjoyed enormous success with Salinero, whose career might well have been overshadowed by the memory of his revered predecessor, Bonfire who, together with van Grunsven, first brought Freestyle Dressage to centre stage. But Salinero (Salieri x Luna [Lungau]) followed faithfully in those very famous hoofprints to become a star in his own right, taking Olympic individual gold in Athens in 2004 and again at the equestrian events of the Beijing Olympic Games in Hong Kong four years later. 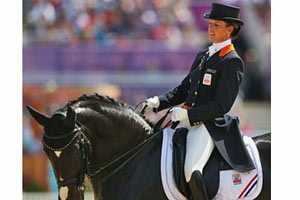 And he helped van Grunsven to become the most prolific winner of the FEI World Cup Dressage title – she won it nine times over a 13-year period between 1995 and 2008. Salinero first came to prominence in 2003 with victory in the Dutch National Championship and was part of the Dutch bronze medal winning team at the London 2012 Olympic Games at Greenwich Park last summer which brought his spectacular career to a fitting conclusion. Salinero first came to van Grunsven at the age of six. “He was meant for an American client but he didn’t buy him. Sjef said I should definitely ride him once. From that moment on I knew he was a special horse. He is always willing to work and has a lot of quality,” van Grunsven said.